I had read Ritu Lalit before, once. I interact with her on a daily basis, virtually. Between you and me, I prefer the cybernetic Ritu much more than the author. She can kill you with her wit, and hang you as a trophy on her wall. Oh, and the plaque would have a fitting obituary too. That is her, not the one to mince words. And totally unapologetic about who she is. Somehow, that bit of her never got translated onto the book I read. 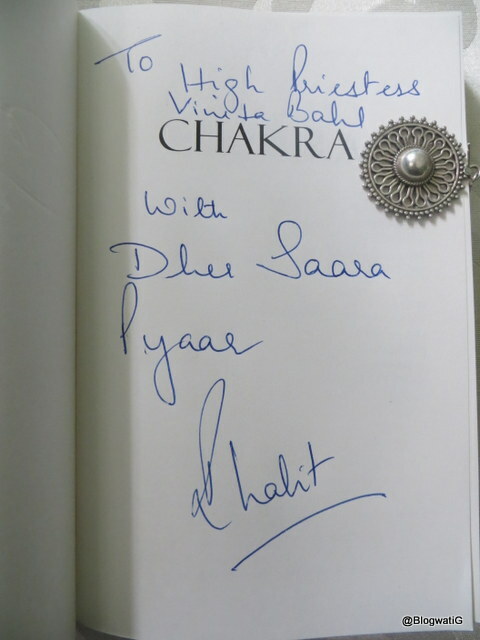 Hence my expectations from Chakra – Chronicles of the Witch Way were limited. I was looking at finishing the book in one go. More importantly, I was hoping to give an honest review to an author, and to a friend. So help me God! 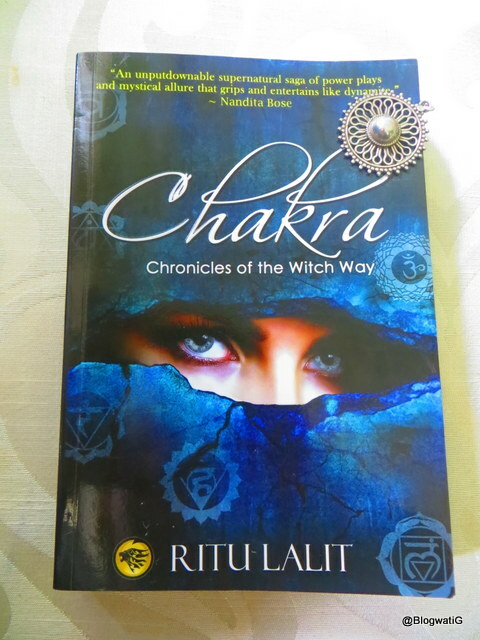 Chakra is Ritu’s third book, and the first in the chronicles of the witch way trilogy. It talks about Japas and Japnis (witches and wizards) with awakened kundalinis and supernatural powers. Parineeta Mohan is one such Japni who has renounced the witch way. She lives like any other ordinary human being, (or a muggle, if you may please) and has kept their legacy hidden from her nieces and nephew. Alas, teenagers do find trouble at the most unexpected places. So when Sandeep, Samaira and Roma go missing, Parineeta has no option but to return to her roots to trace them. And of all the people, she has to trust Jorawar, a Japa who also belongs to the dreaded organization Pax. However, there are no free lunches. Peace of mind is often bought in exchange of war of thoughts, words and deeds. The question is, how far will Parineeta go to achieve this? And is this Parineeta’s story at all? The only one who could answer all these questions was the book. So I began to read. Chapter one turned out to be quite something. Ritu Lalit, the clever woman that she is, had introduced 5 warring clans, one aging guru, 17 characters and one veiled murderer in ‘The Bloody Battle’. Phew! From there on she made it no easier. More characters joined the bandwagon in the next two chapters, with a time leap to add to my woes. I realized I could not just flip the pages of this book. I stopped reading, went back to my drawing board and crafted a bloodline to help me keep track of the cast. Green for the clans, Red for the clan leaders and their lineage, and Blue for the Clan members. Chakra – Chronicles of the Witch Way was demanding my undivided attention. Chakra journeys through the sands of time, in a parallel universe, along with the one we live in. The five clans, two who are extraordinary by blood, and their leaders, take you through a cinematic experience. From Jaipur, to Delhi, to Mumbai and Odisha, the tale travels along with them. A caravan of plots, the book moves at a quick pace. The action and drama keep you on your toes. It is more like Harry Potter meets Vedic wisdom, behind the veiled backdrop of current global scenarios. Even then, execution of such a gargantuan mythological fiction requires gumption. And that Ritu Lalit has loads, we established that at the onset. ‘Suspension of disbelief’ is the principle on what cinema thrives. If you can establish your hero to jump buildings, the audience will buy it. A character needs room to grow or an incident strong enough to change him. Chakra, to a great extent, provides that stimulation. Sometimes over pages, at other times in a couple of sentences. If I had to pick my favourite character, it would be Marjina Sara. A no nonsense Japni, she gives it to you as it is, sans the gift wrapping and ribbons. Her tongue in cheek humour, an absolute delight, if you ask me. Considering it is the first of a trilogy, perhaps some dormant characters might pick steam later. Though there were some characters and settings for convenience. While some others, I felt, were revealed a tad bit too soon, but hey, it ain’t my story to tell. However, a story of this magnitude and many layers, needed crisp editing. I wish there was a bloodline and a timeline to go back to. And a glossary of terms would have definitely helped. Keeping the script watertight would be a herculean task, no doubt. But as a reader, many a times, confusion reigned supreme. Hemant Rawat or Hemant Ratra? Maya Israni or Lata Israni? Was Akshat a Jalaj or a Pallav? If the guns were an Agney decision, why were the Pallavs using them? If there was no phone at Lata’s, how did the communication happen between her and Jorawar? Why did the kids head to trace someone after two months of the incident? Was it possible for an injured man to identify someone from a group picture on a cell phone? Marjina had a strong Mumbai accent, but wasn’t her shop in Delhi? Shouldn’t Nita be worried for both her nieces, at the Baoli, for once? But having said all of the above, Chakra speaks volumes about Ritu Lalit’s story telling abilities. She has grown as an author, and how. This was not an easy tale to tell and a trilogy is ambitious. Yet, with all that it offers, it makes for an interesting read. I now await to read the journey of the teen witches in the next installments as it is a Chakravyu that I have entered into. Who knows, these japnis could be living amongst us, no? Fantastic review! I have had a break in continuity after reading the third chapter, primarily because I am not familiar with this genre and was constantly getting confused between the characters and their clans. 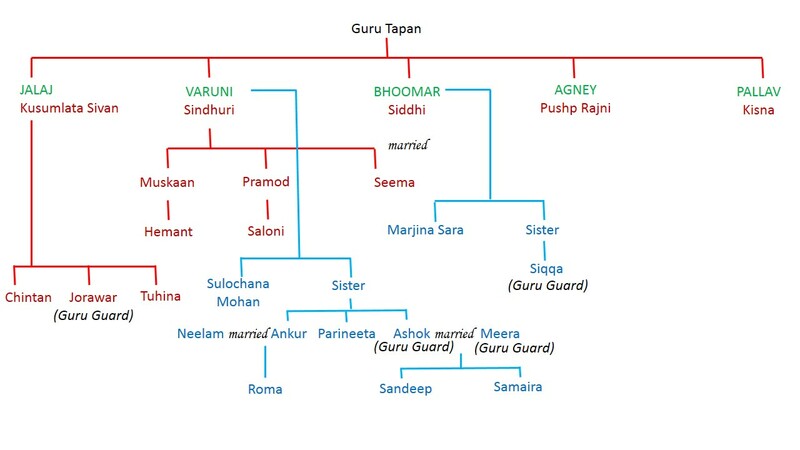 But now with this org chart, I will (re)start the book with new interest! Nice review…this is one book I have been hearing about and I think its time I too grab and enjoy the wiccan tale. M sure the chart u have prepared to keep track of the characters will come handy! shaivi recently posted…It’s all about loving your blog buddies! A very balanced review BlogwatiG. You are crisp, to the point and Like Rickie said the org chart helps a lot. This was a very difficult genre for an author to attempt and it is only someone like Ritu who can attempt such a thing. Ruch recently posted…In Nature we Rejoice ! Thanks, Ruch. Coming from you, I know it is heartfelt. Yes, I am totally elated about the chart right now. Happy to help. Nicely decoded Vinita. I haven’t read the book as yet, but the flow chart will help. Kicking myself for not reading enough. Nicely penned, Vini! Yes, I felt the same confusion with so many characters after I read the first chapter. You have not given away too much yet pointed out to the strong points and flaws. I love simplicity and your writing gave that to me. Kudos! Rachna recently posted…She needs you! Thanks Rachna, it was a challenge to write a simple yet non biased review, especially since I know Ritu. But if you say I have done a fair job, I am very proud of myself. Nicely done! And, now I can use that chart when I read the book!! Oh, and I love the…is it a bookmark?!! And oh, that is my earring…………thank you for noticing 😀 Pretty cool, eh? What a brave review, Vinita!! Usually even I get confused with too many characters in novels, and have to go back and re-read them to recall. The chart came out of necessity. I was taught to be creative in adversity, that’s what I did. Happy it helped. « BlogwatiG is Two Much!